Mr. Titmouse: Hey, House Lady ... I just stopped in to get a little sunflower seed. Me: No problem, help yourself. 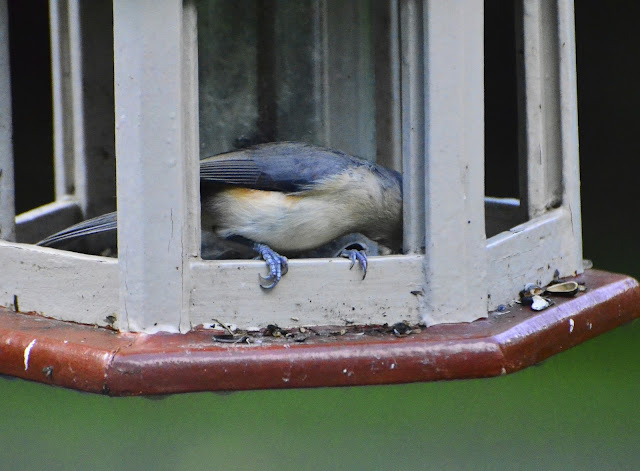 Mr. Titmouse: The supply is getting mighty low here. By the way, rumor has it that you're leaving town again and if that's the case, are you going to fill this thing up before you leave? Me: You are as bad as the squirrels worrying about the food. Let me remind you that there will be someone here watching over you and making sure your food does not run out. All will be fine! Mr. Titmouse: Great to hear that! Gotta run now and spread the news! 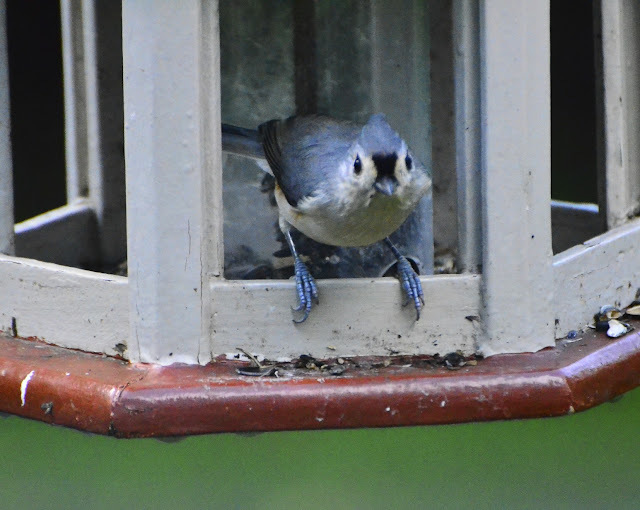 Those chickadees were driving me crazy with their concerns on how they were going to get fed. Oh, those darn birds! Just because they're SO cute doesn't give them permission to not be thankful for such a wonderful provider! 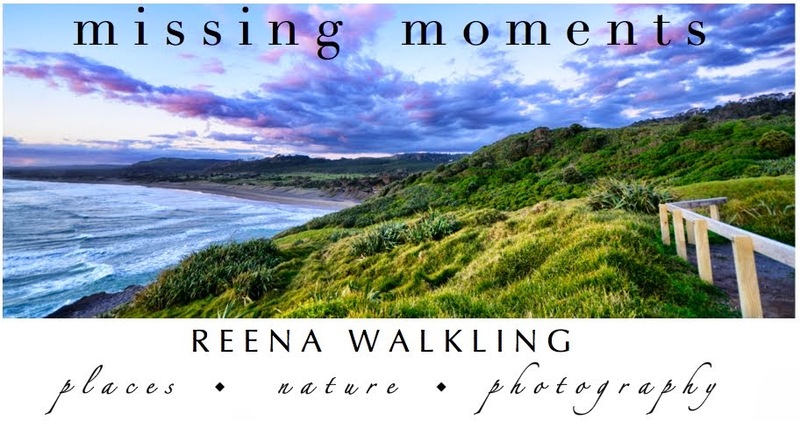 Love your captures and dialogue with the feathered ones, Reena! Hope you have a great week! Thanks for the smiles! I loved this and they are beautiful. Maybe I should try and talk to my birds a bit more . Lovely Lovely captures. TOO cute! And I love his blue feet! I had to stop feeding the birds this summer because all the starlings were coming in flocks and gulping it down, I'm hoping to resume when it gets cold. He is very cute, although ungrateful! At least he pauses to pose for photos, no? Do your bird friends fly south for the winter? You caught him from beginning to end! Oh how cute! The little face that greeted me when I opened your blog is just adorable. I love your series of shots and the commentary! That was great fun, thanks Reena. Such an entertaining conversation with gorgeous photos! That first shot is perfect. Hey you, da seeds is gettin' a little low, can ya top us off? You have such fun! Wonderful post! Have a good trip! Soooooo glad someone else talks to their birds. Sometimes I feel nuts doing it but then again no one ever accused me of sanity. 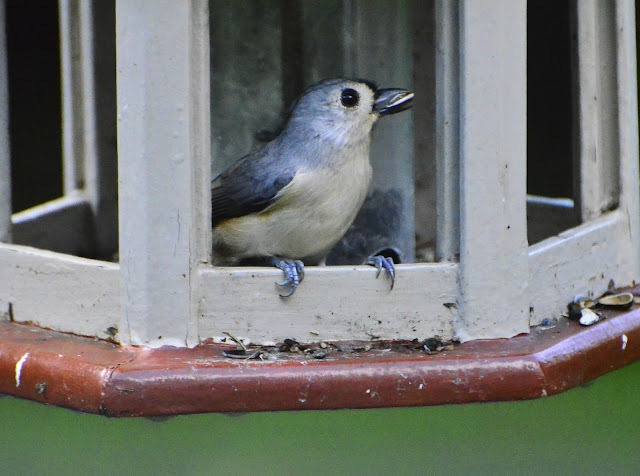 Cute post, I love your Titmouse. Have a great trip! LOL... how cute that post is. I love this blog!! Heaven forbid you run out of food. The titmouses are bad enough, but the chickadees swear at you. lordy, you are one traveling soul! I enjoyed the photos and the conversation and the smiles i had on my face while listening to your "bird talk"
Oh - you manage to get the cutest shots of birds! 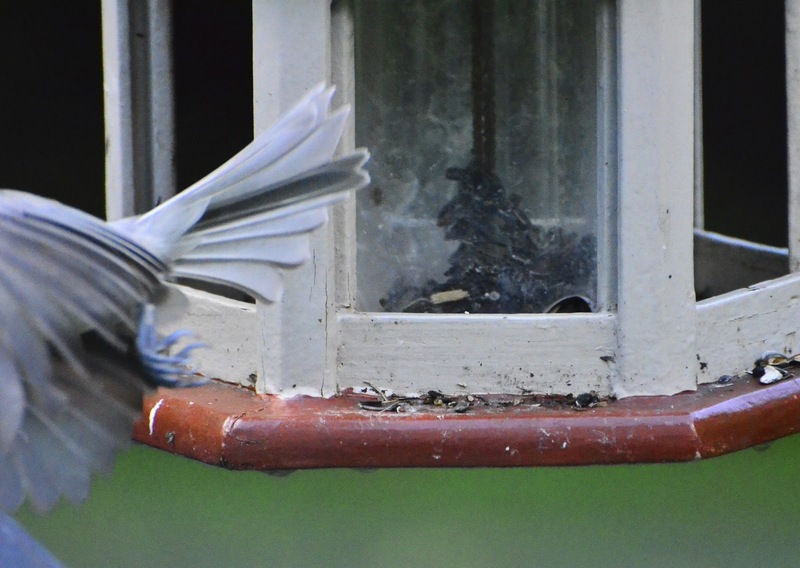 Great photos.These birdies move fast,and don't hang around long. LOL the backyard birds are all about their needs this time of year. Just before the cold weather hit this weekend, I needed a traffic director at my feeders. Such cute shots.. And such a fun post.. I was smiling the whole time I was reading.. Hope you have a great trip..
Great pictures and fun little story. Oh that is one cute bird .. and such a mouth on him! Getting a little bossy isn't he:) Have fun on your getaway! Wherever you're going I hope you have a great time! Man, word sure does spread fast in the animal kingdom! away....again, really?? you one lucky girl!! I just love your conversations with your feathered friends. You be trippin, reena (pun intended) - LOL! Marvelous play. They are getting a little beside themselves - EXPECTING? Well, we all know about expectations - don't we? Cheers! !